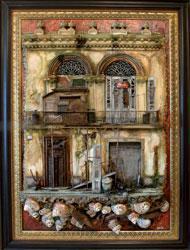 Cuban artist Roberto Loreto credits Old Havana as his greatest source of inspiration due to its collage of back-to-back artistic elements on the buildings and its different architectural styles. To this fabulous eclectic city, he continues, we must add the great quantity of original architecture and the way the daily life of the population coexists in these surroundings, giving us a place of en chanting mysticism, a source of inspiration for any artist. In his exclusive interview with Cubaplus, Loreto, 40, graduate in architecture and industrial design, said his imagery technique was first used centuries ago in religious temples in the painting of three dimensional elements. "My work is a painting that becomes a three-dimensional mural. I express myself both as a sculptor and painter, always using bits of surrealism, where the social topic reigns and the aesthetic recreation of fantastic mythological figures and beings depict the urban environment of present day Havana." "I use mixed techniques with new material s, like the combination of resins and ceramic adding wood and metallic elements, turning the works into small and medium-sized art installations." Talking about his beginnings as an artist, Loreto said he began working in the fin e arts in adolescence and in 1990 brought together a group of craftsmen to sell small works of art at Cathedral Square in Old Havana, a trendy art location at the time. "The group perfected its skill s, reaching first class levels of craftsmanship. I have always worked with them, but more importantly, we are all a family, turning this into a family business where the most important thing is the fondness we feel for each other and the artistic value we give to our work." Loreto also spoke about his future plans. Later this year he will be holding an exhibition in Toronto and creating a cultural foundation for the exchange between Cuban and Canadian artists. And most important for the future: work, work, work and create.